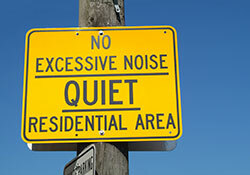 Noise is an underestimated threat that can cause a number of short- and long-term health problems, such as for example sleep disturbance, cardiovascular effects, poorer work and school performance, hearing impairment, etc. Noise has emerged as a leading environmental nuisance in the WHO European Region, and the public complains about excessive noise more and more often. more than 30% is exposed to levels exceeding 55 dB(A) at night. Only limited international figures are available on the health impact of environmental noise in the European Region. WHO/Europe published preliminary estimates in 2011. Some groups are more vulnerable to noise. As children spend more time in bed than adults, they are more exposed to night noise. Chronically ill and elderly people are more sensitive to disturbance. Shift workers are at increased risk because their sleep structure is under stress. In addition, the less affluent who cannot afford to live in quiet residential areas or have adequately insulated homes, are likely to suffer disproportionately. Nuisance at night can lead to an increase in medical visits and spending on sleeping pills, which affects families’ budgets and countries’ health expenditure. The gap between rich and poor is likely to increase if governments fail to address noise pollution. moderate evidence of effects on blood pressure and catecholamine hormone secretion.